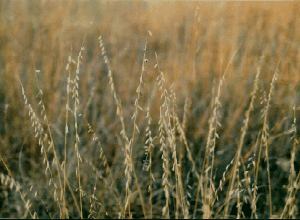 Stipa spartea, also known as Needlegrass, this cool season bunch grass likes dry to mesic conditions. The stems can reach 2 to 4 feel tall in early summer. 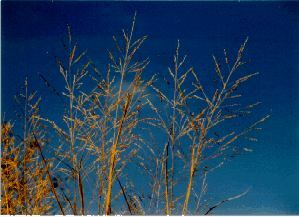 The seedheads are conspicuous because of their long twisted awns that are quite sharp, which can injure livestock as well as humans. 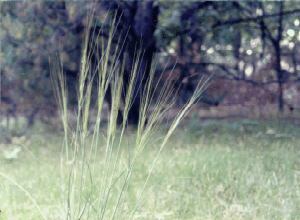 Koeleria cristata, this cool season native perennial grass is usually seen on dry prairies, sandhills and open woods. June Grass grows to a height of 1-2 ft and has dense silvery-green seedheads that are three to five inches long. Bouteloua curtipendula, this native grass can be found on well-drained soils. 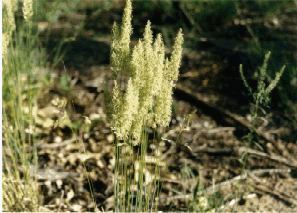 It has oat-like seeds that hang downward and is known for producing a high quality forage. It's easily established and considered excellent for conservation use. Panicum virgatum, Switch Grass has an extensive root system and provides wonderful erosion control. This perennial is the earliest maturing of the native warm season grasses. 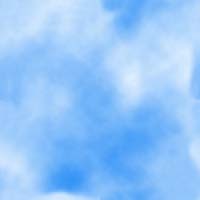 It is widely used for wildlife habitat improvement and readily consumed by livestock. Switch Grass is easily identified by it's wide, large seedhead and prefers lower, moist areas but will do well in drier places. The plants and seeds from Switch Grass provide food for songbirds, pheasants, ducks, geese, wild turkey, cottontail rabbits and muskrats. It can be cut for winter hay. Elymus virginicus, this short lived perennial is often found along marsh edges and in floodplains preferring the damper soils. 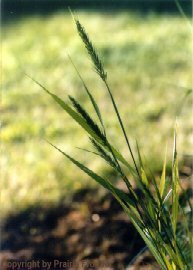 Virginia Wild Rye will do well in moist and dry sites, shade and full sun, which makes it unique among the prairie grasses.